Thank you. Thank you for such a warm welcome back my friends. If you went to a cafe for a coffee and cake or a tea and cake or just cake, what kind of cake would you look out for and choose? Would it be a gooey chocolate number or something lemony, maybe one with lots of icing or perhaps no icing, spicy and gingery, soft and light, sturdy and fruity. There are so many choices and I wonder what you would choose? The reason I ask is that I’m venturing into baking a couple of cakes a week for a local cafe – the baking project is a little sideline, an exploration, a learning curve. In all honesty I make the occasional cake, usually as an excuse to hide and disguise courgettes and pumpkins 🙂 But seriously, I value your friendship and I value your opinions and yes I value your baking skills too! I’ve made many a cake based on a recipe from my blogging friends and many of them are now firm favourites. Today’s cake, a carrot cake with cream cheese icing is popular on the promenade. In fact so popular it generally lasts a blip of a second. 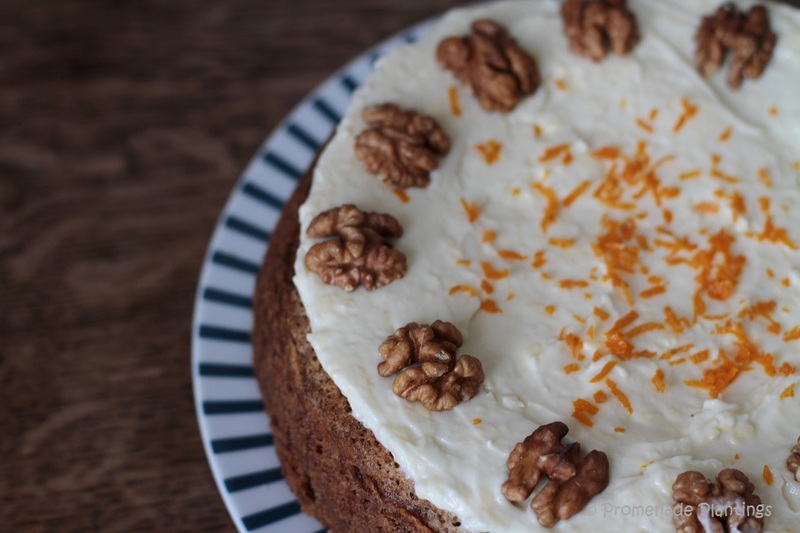 I can’t take the credit for the recipe as that has to go to Celi from The Kitchens Garden, (for the super carrot cake recipe click here). You all know Celi don’t you – she of farmy fame, well let me tell you she should also be known for her carrot cake fame! So back to this potential venture and keeping our focus on sweet cake treats, do you have a favourite cake recipe on your blog that I could try? There are a couple of provisos – a large (ish) cake that can be cut into 12 pieces, looks appetising and tastes fab! Round or bundt cakes are good choices, layers a plenty also work, but the remit is no muffins, tray bakes, biscuits or cookies, tarts or tortes and apparently the jury is out on pound cakes too. I’m so curious to know what you’d recommend. As a friend feel free to leave a link to your recipe in the comments. And of course I will make them – slowly and surely…. and you never know by the time I’m grey and ancient I will have mastered the art of icing a cake so that it looks presentable and enticing. One last question – would this cake tempt you, does it look good enough to eat? I think it would be improved by adding some of the icing to the sides and then covering it with chopped walnuts for that extra gorgeous “eat me” appeal. I’m always about more icing. Especially cream cheese. That’s one of my favorite cakes, too. All my recipes are super easy and quick to prepare. I am sure to think of loads of others when I hit send. Best of luck Claire – looking forward to reading more about how you get along. Hi Many thank you for your brilliant suggestions. The chocolate and spicy ones particularly appeal to me. I’m [presuming I could just make the mixture up and make a cake with the muffin/cupcake mixture, and if so would it be best to make two smaller cakes or one larger one? God I’m such a novice at this!!! Hi Celi, I KNOW your chocolate cake recipe very well, it gets made all the time and gets goobled up just as quickly as your carrot cake ! I think I would add some kind of smart icing or gooey something to the chocolate cake……. do you have any other recipes oh font of all cakeness? Unfortunately for my waistline, cheesecake is always my FIRST thought!! I’d eat it. No questions asked! Contrary as usual I don’t like frosting or icing. So for the awkward squad some savoury scones, a deep rich dark ginger cake, a light tea bread or an orange or lemon drizzle cake (not too sweet please). Your cake looks delicious just as it is, sometimes less is best. I love making cakes and I’m sure you’ll have great fun testing lots of recipes. Wow, that’s fantastic you’re baking cakes for a local cafe Claire! That carrot cake looks beautiful. I’d go for it for sure. 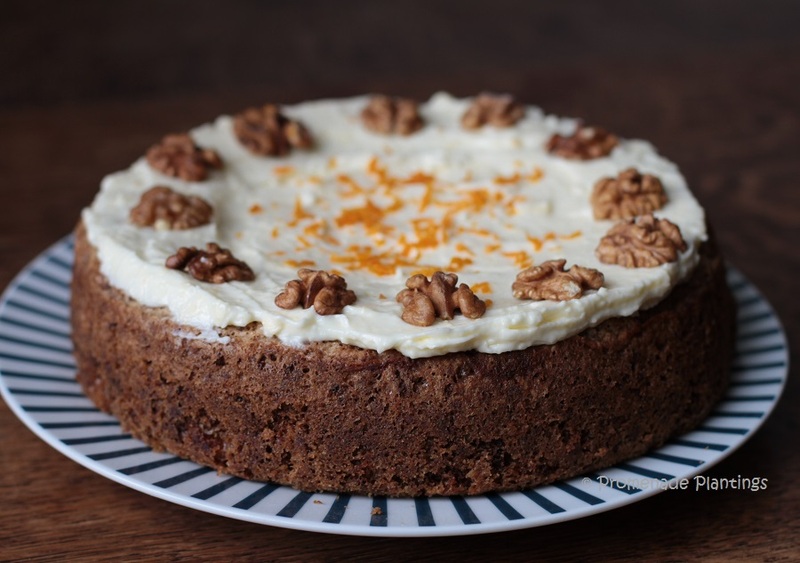 I wouldn’t say no to more icing up the sides and more chopped walnuts – excellent idea! The cake recipes on my blog all convert into cupcakes or muffins so they don’t meet your brief. I LOVE a good baked cheesecake though, and Donna Hay’s recipe is the best. A mixture of cream cheese and ricotta, blended smooth, and lots of lemon zest! I’m making it on Sunday with a gluten-free crust for a family get-together. Best of luck with your new venture. Before I even clicked properly on the link my answer was going to be “Carrot Cake” – I love it but don’t make it enough. I love loads of icing which I save till last and then savour every delicious mouthful. It’s not on my blog, but I love making this one and have received rave reviews (and repeated requests for remakes!) http://www.americastestkitchen.com/recipes/7014-french-apple-cake I tend to leave the rich chocolate numbers for dessert and enjoy the more classic flavors (lemon, carrot, spice, etc) for coffee or tea. I would eat any cake that you made, Claire. And there are many different cakes that I love. But though I have done quite a bit of baking myself, I couldn’t recommend a recipe, because I cook and bake in a very haphazard way, guessing at the ingredients and the proportion almost every time. Sometimes it comes out very well… and other times, I blame the results on my mood. One cake that I particularly like is a plain white cake, on which I spread a layer of blackberry preserve or jam. But here again, I have no recipe to share. Hmmm- I would normally go for a chocolate-type cake! I love your (Cecilia’s cake! )carrot cake. It has just the right amount of icing to cake ratio for me. I would love to have a simple slice of unfrosted apple cake with my coffee. I think the less frosting/icing is just the best for afternoon tea or coffee time cakes. What a wonderful thing to start doing…baking cakes for a local place! I look forward to lots of new ideas to use. I am so happy you are back. I favor lemon and fruit desserts, while Mr R insists chocolate is the best. So many desserts and so little time! I did an internship at a local bakery and all things chocolate sold the best. Have fun baking while you learn about your baking audience! Your cake definitely looks good enough to eat, not too gooey. I might go for a chocolate with a runny middle, but most of the time I like a not too sweet, simple cake like the ones on my blog this week. Wish you all the pleasure of baking and luck in succeeding in this new venture. Had to laugh that tho’ Celi’s is one blog I never miss, her carrot cake recipe was totally new 🙂 ! Now since I have had two tiny slivers of friends’ birthday cake in some thirty years I’m obviously not going to be of help: have baked the very very occasional banana or nut bread only! Perhaps I should try Miss C’s 😉 ? Below the first picture on this post is a link to Barefoot Contessa’s original ginger cake with orange frosting recipe and then what I did to make it wheat and dairy-free. https://bluegrassnotes.wordpress.com/2011/11/24/relaxed-and-healthy-ish-thanksgiving/ This cake is seriously amazing. And I usually put anything chocolate above anything else. That’s how great this one is. Is cheesecake a fair option? I like it better than any real cake. I like plain cheesecake best, but also pumpkin, chocolate, coffee, lemon and ginger flavors. Yes, I would definitely eat that cake. It looks scrumptious. My choice depends on the time of your…right now this one looks very tempting – thanks for sharing, it’ll be made in due course! I would want a cake that had lots of different components, something I wouldn’t spend the time to make at home. Or something I have never tried before so I’d know if I liked it and it was worth making myself. A carrot cake with cream cheese frosting would be perfect as it’s something I’ve never tried before. How exciting…have fun baking! I would definitely try this gorgeous carrot cake…lately I have been curious about chai tea or earl grey infused cakes or donuts…I have to get some donut tins! Happy Baking! What a great venture. You should have some fun figuring out the best of the best. I actually like the look of this carrot cake with the frosting just as it is. To be honest, it would appeal more to me this way than with more icing. Just another way to think about it. I prefer a little sweet, but not too sweet, and so I like being able to see the richness of the cake without a covering. 🙂 I hope you’ll be able to share photos of some of your accomplishments. It would be fun to follow along! Actually, I love that the cake is beautifully textured and moist enough to look enticing without icing on the sides: it’s got plenty of come-hither for *my* longings. 😀 I tend to feel like desserts (especially cakes) that look too frou-frou are off-putting, and something less pretentious is far more appealing to me to actually savor eating! So, darling one, *this* cake speaks to me. Yummmmm. Carrot cake or spice cake would be my favorites–or anything a bit unique. For me (back when I was thin enough to go out and buy cakes regularly) the key was a smaller cake, so you could share with a few people and not be drowning in leftovers. Congratulations on your new venture! I love dense, moist cake. Chocolate is a bonus. Good luck with this venture, Claire. Moist and perhaps a bit if sugar in icing. I think carrot cake is a favorite of everyone…people convince themselves that it is a healthy choice because it is made with a vegetable. 😀 Good luck with your new endeavor.